Keep in mind that you’ll be spending a week in the Rocky Mountains, where temperatures can range from the mid 20s (75 Fahrenheit) in the day to below freezing at night. During day hikes you need to be prepared for sun or rain, or even snow at higher altitudes. Good hiking boots, layered clothing that is both warm and waterproof, and a warm sleeping bag are essential. This complete day hiker's checklist and equipment guide will help with your planning and equipment purchases. We supply hand sanitizer for use at the biffies and at the dining tent. The hand sanitizer is not a replacement for your own biodegradable soap. Snack food must be placed in a Ziploc bag. No food can be left in tents. Skyline provides animal proof containers in the dining tent for your snacks. Please ensure your Ziploc bags have your name on them. Hikers must carry out any leftover snacks or beverages so do not bring any more than you will eat in the 5 days of camp. Waterbag for carrying wash water (or ice cream bucket). Bowls are supplied in the Wash Tent. Don’t pack your hiking boots! You’ll need them to get into camp. 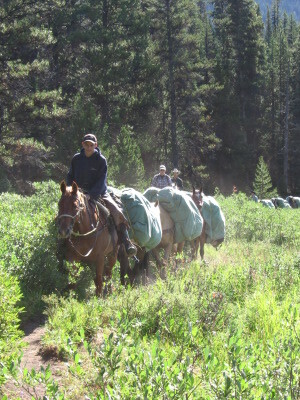 Your bag will be transported to and from camp by truck and pack horse over rough terrain and, while we take all precautions possible, Skyline Hikers and its outfitter are unable to take responsibility for damage. 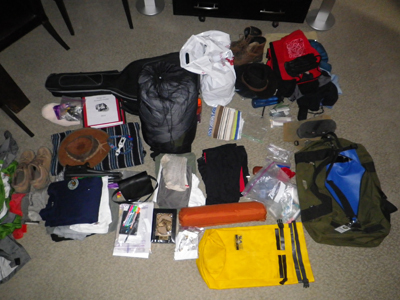 Photographic equipment, binoculars or other valuables MUST NOT BE PACKED IN YOUR DUFFEL. If you are planning to take a folding chair to camp it must be carried in with you, tied to your day pack and MUST NOT BE PACKED IN YOUR DUFFEL. Horses have been injured from careless packing of these chairs. If you have difficulty carrying and/or lifting 42 lbs you can put half of your gear into a smaller bag and the remainder in your large bag. When you arrive at the bus, put the smaller bag into the larger one for loading. When you get to camp you can take the smaller bag out of the larger one and carry each separately to your tent.